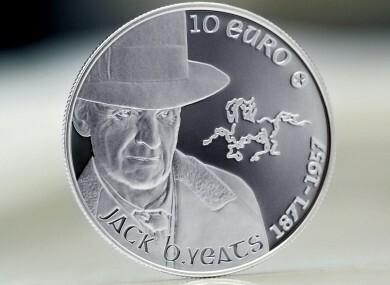 A SPECIAL COIN dedicated to Jack B. Yeats was launched by the Central Bank of Ireland yesterday. The €10 silver-proof coin was minted to celebrate the life and work of the Sligo artist. It features a portrait of Yeats overlooking a smaller sketch of a horse. The painter often used the horse to depict Irish rural life and as a symbol of movement and drama. As well as a commemorative coin, it is also Ireland’s contribution to this year’s European Silver Coin Programme which allows each eurozone member issue a collector coin in celebration of a European artist. There will be 12,000 coins issued by the Central Bank which can be purchased for €46 each. Email “Central Bank issues Jack B. Yeats collector coin”. Feedback on “Central Bank issues Jack B. Yeats collector coin”.